What is Ammonium Thiosulfate (ATS)? Thiosulfate (S2O32-) fertilizers are a liquid sulfur additive than can be combined with various other fertilizer sources to satisfy plant nutrient requirements. While many fluid thiosulfate fertilizers are available, ammonium thiosulfate (ATS) is the most widely used fluid fertilizer that contains sulfur. It is composed of sulfur dioxide, elemental sulfur, and aqueous ammonia. Product examples include Kugler ATS and Thio-Sul®. Where has Ammonium Thiosulfate (ATS) been tested? 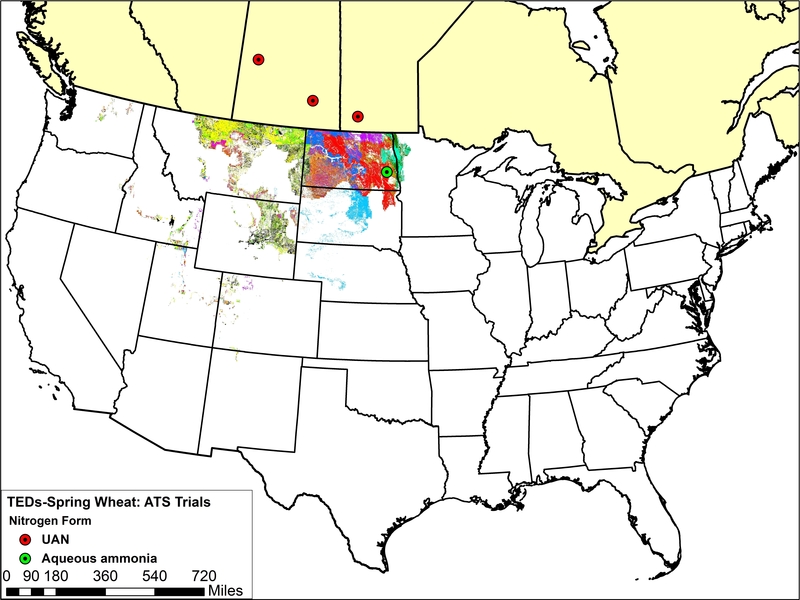 The maps below shows trial locations for corn and wheat. The trial locations have been superimposed over the Technology Extrapolation Domains (TED) Framework. The TED Framework is described further on the ATS and TED Framework page. How has Ammonium Thiosulfate (ATS) performed? An intensive and extensive review of the literature was completed to assess the effectiveness of ATS (Ammonium Thiosulfate) to increase yield of corn and wheat. All the research was completed on small plots. 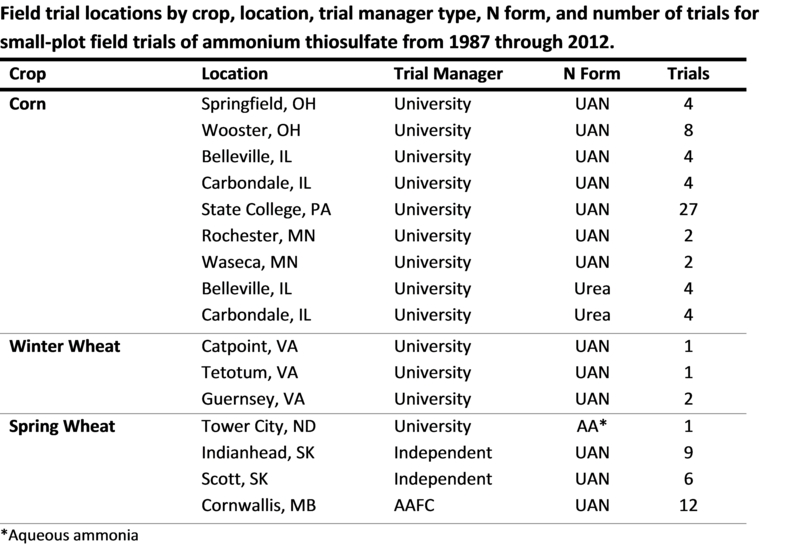 The average corn yield change measured for ATS when ATS was applied with fertilizer N was not statistically different from zero bushel/acre. ATS did not have any beneficial yield impacts. The average yield change measured for ATS on wheat when ATS was applied with UAN fertilizer was not statistically different from zero bushel/acre. While a yield increase was found for spring wheat fertilized with aqueous ammonia (AA), these results were based on a single trial and should be interpreted with caution. 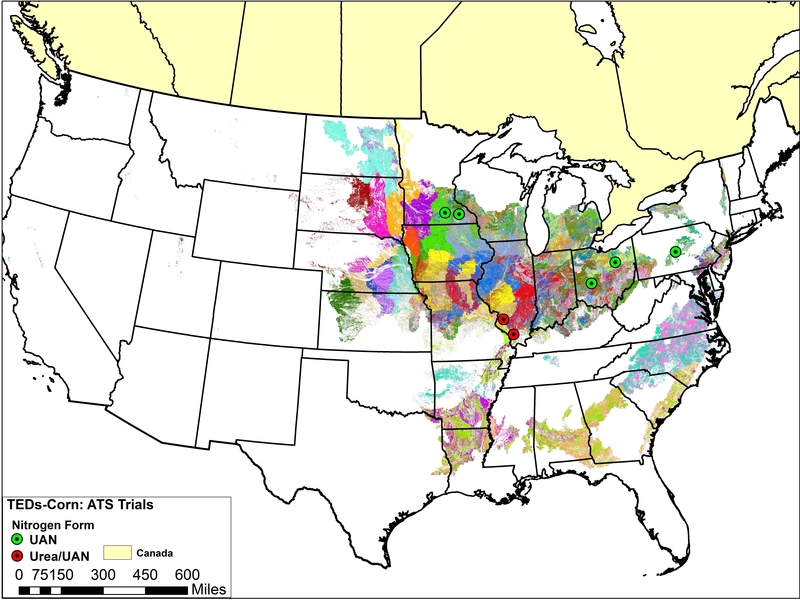 To see if Ammonium Thiosulfate (ATS) trial locations are relevant to your operation, visit the ATS and TED Framework page. To view the complete research report, including references, please visit the ATS Research Findings page.